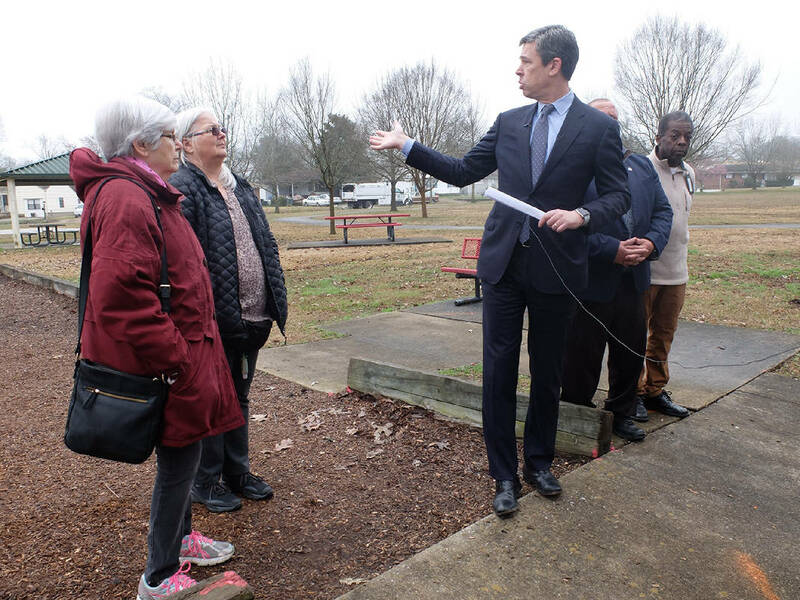 Chattanooga Mayor Andy Berke, center, talks to Brainerd resident's Sandra Ledford, second from left, and Pat Harvey about improving the Tacoa Park with funds designated for the Neighborhood Reinvestment Fund for 2019. Ezra Harris is seen, at right. The Tacao Park in Brainerd is getting new playground equipment, pavilion upgrades and other improvements as the first project in a new neighborhood improvement initiative that Mayor Andy Berke said Monday should help broaden the city's appeal and amenities. The estimated $60,000 in improvements planned for the playground on Tacoa Circle in Brainerd is part of the $1 million Neighborhood Reinvestment Fund the city created in the current fiscal year to aid neighborhood projects, small businesses and affordable housing in Chattanooga. Berke created the fund from money being paid back to the city by General Electric after the Alstom factories GE acquired in Chattanooga failed to meet its promised job targets when the plant closed two years ago. Berke said he plans to expand the fund in the next fiscal year, which begins July 1, and he plans on announcing business and housing projects financed by the fund over the next couple of weeks. "There are small things you can do that make a big difference," Berke said Monday. "One of the things that we have been talking about on the council for the past several years is how we can listen to our residents to make changes in their neighborhoods that make a big impact. We need to tailor our solutions for every community." Tacoa Park is surrounded by houses on Tacoa Circle and the city park, which was developed more than a decade ago, includes a walking track, baseball diamond, playground equipment and a pavilion with picnic tables. The improvements will repair some of the aging equipment and add new amenities for the community. "This is the kind of place where we want families and kids to come and feel great about this public space in the midst of this neighborhood," Berke said, noting that other neighborhoods should be getting sidewalk additions from the fund. "When people get [out] and walk around it keeps us healthier and it makes our city safer and more connected." Sandra Ledford, a Brainerd Park resident who has lived near Tacoa Park for the past 47 years, said the neighborhood has been requesting improvements that the city has been gradually making over the past 10 years "and we hope this will make a lot more improvements," including electric service to the pavilion, a resurfaced track and repainting and refurbishing of playground equipment. "It will be fantastic to see these upgrades," said Pat Harvey, another Brainerd Park homeowner. "There are all kinds of possibilities for this park, which has been a great part of this neighborhood." The Tacoa Park upgrade also gained praise from neighboring communities. Ezra Harris, president of the Woodmore Neighborhood Association, said the park improvements announced Monday should help the entire Brainerd area. "Even though this may not be going to our neighborhood now, we are excited for Tacoa Park," Harris said. "We're proud of our Brainerd rec center and, while we would like to see more money for home in our area, we're excited for people in other areas also." Next Monday, Berke is scheduled to outline his Small Business Corridor grants, and the mayor will discuss the affordable housing part of his Neighborhood Reinvestment Fund on Feb. 25.